Evan recently shared shared a link to Bret Victor's CUSEC presentation (which is worth watching, but not what this post is about). In the (internal) thread, Ami Fischman mentioned that, in addition to being more reliable, Vimeo's HTML5 player allows the use of the playbackRate attribute to speed up playback without affecting its pitch (at least with the codecs used by Chrome). I'm a big fan of listening to podcasts at higher speeds (especially via Downcast, which supports up to 3x, though I haven't made my way that high yet), so the idea of being able to do this for any video was very appealing. YouTube's HTML 5 player already makes use of this, but for those sites that don't, I've made a Chrome extension (source). It adds a context menu that allows you to control the playback rate for any <video> or <audio> element. Note that Chrome's audio implementation currently has a bug which may result in the 1.25 and 1.5 rates not working, but it should be fixed soon. Also, Vimeo turned out to the tricky, since it overlays other nodes on top of its <video> element, and buffers very slowly. Your best bet is to let the video buffer a bit, and then right-click just above the controller. Bonus tip: If you are viewing a video in QuickTime Player (the QuickTime X version) and miss the old playback rate controls from the A/V Control palette, you can instead option-click on the fast-forward button to increase the speed. Any inside knowledge on what kind of algorithms the codecs used by Chrome use for time stretching ? More importantly, how does the quality compare to eg. ScaleTempo , SoundTouch ? desired speed ( eg. 1/8 , 2.67x , 4x). Anything such (or automagical) in Chrome ? fast enough connection, fast enough computer to decode the video that fast. and any speech has to be quite clear and well articulated at 1x to begin with. Matti: As far as what algorithm is used, I'm not familiar with that part of Chrome. There was a pointer to http://code.google.com/p/chromium/source/search?q=file%3Aaudio_renderer_algorithm_base.cc in the internal discussion about this, but it doesn't seem to contain anything too interesting. Unrelated question--do you know why some youtube videos allow you to adjust playback speed, but not all? 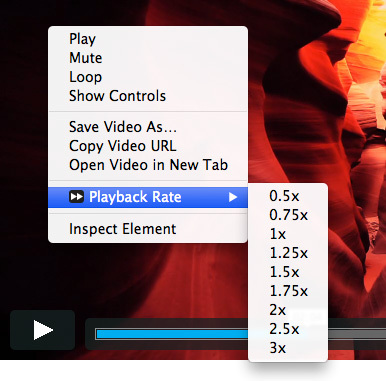 @Gerrit: I believe only videos that use the HTML5 player can adjust the playback speed. Some videos have features (especially ad-related ones) that make them fall back to the Flash player. The extension doesn't seem to work anymore on Vimeo. I tried right clicking above the controller as you mentionned, but the Playback Rate options never appear in the right click context menu. This is a must have extension for Vimeo! @123456: Thanks for catching that, should be fixed in version 1.2 of the extension. Playback Rate currently makes the Vimeo player controls disappear from the screen so you can't control the player anymore. I've tried disabling the Playback Rate extension and the controls reappeared as soon as I refreshed the screen. @123456: Thanks for the report, should be fixed in version 1.2.1.